A couple of weeks ago, we posted an update on the Oil-Climate Index (OCI) here, which was launched by researchers at the University of Calgary, the Carnegie Endowment for International Peace and Stanford University, to compare the environmental impact of different types of oil. The index compares 30 global crudes, taking into consideration how each is drilled, refined, shipped and burned. 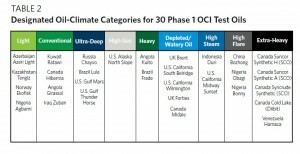 The OCI is intended to be a transparent tool for investors, policymakers, industry, the public, and other stakeholders to compare crudes and assess their climate consequences before development decisions are made as well as once operations are in progress. Below we break down how a selection of Canadian crudes compared, the role of data transparency in these types of comparisons, and what is being done in the Canadian oil sands to reduce GHG emissions. Six Canadian crudes were included in the index, including: Suncor Synthetic H (SCO), Suncor Synthetic A (SCO), Syncrude Synthetic (SCO), Cold Lake (Dilbit), Midale, and Hibernia. The GHG emissions intensities of all oils assessed (grouped by reservoir category) are shown in the chart below. Canadian oils belonging within each category are indicated on the chart. Source: Adapted from Figure 1 in the OCI report. Canadian oil sands crudes are listed in the highest emitting category, ‘extra-heavy’. This category also includes Venezuelan extra-heavy crude oil. 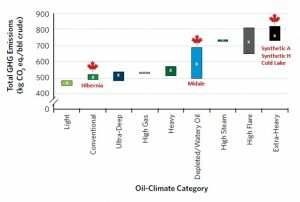 Other Canadian oils assessed, including Midale and Hibernia, fall within categories at the middle or low end of the overall GHG range shown in the figure. Crude oils included within each category are listed in the table below. Source: Table 2 in the OCI report. It should be noted that a lack of data availability limited the number of crude oils that could be assessed in the index. Oil sands producers and other Canadian oil producers generally provide the high-quality, consistent, and accessible data required by the OCI methodology. The chart below presents the results of the GHG emissions assessment for the 30 crude oils benchmarked. Results are broken down by upstream (extraction), midstream (refining), and downstream (end-use) emissions. 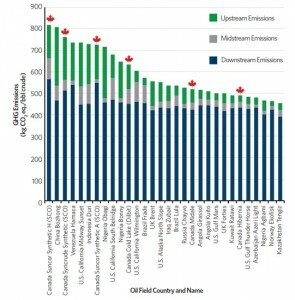 Of the oils assessed, Canadian oil sands crudes are first (Suncor Synthetic H), third (Syncrude Synthetic), seventh (Suncor Synthetic A), and eleventh (Cold Lake) most emissions intensive. However, it should be noted that this ranking changes slightly depending on whether emissions intensity is expressed in terms of barrels of oil (bbl) or energy content of oil (MJ). When expressed in terms of energy content, China’s Bozhog is the most emissions intensive crude, followed by Suncor Synthetic H. Other Canadian crudes assessed (Midale and Hibernia) fall in the middle- to low-end of the emissions intensity chart shown below. Source: Adapted from Figure 12 in the OCI report. GHG performance: What is being done to address oil sands emissions? There are a number of initiatives under way to reduce the GHG footprint of the oil sands sector. Individual producers typically have GHG management plans and invest in energy efficient technologies and processes. Producers also come together under Canada’s Oil Sands Innovation Alliance (COSIA), which is focused on accelerating the pace of improvement in environmental performance in the oil sands through collaborative action and innovation. COSIA’s GHG Environmental Priority Area (EPA) is investigating ways to reduce energy use and associated GHG emissions through the development of innovative technologies. Other Canadian organizations such as Climate Change and Emissions Management Corporation (CCEMC) and Sustainable Development Technology Canada (SDTC) support development, testing, and commercialization of clean technologies, some of which are applicable to the oil sands sector. These are just a few of the efforts underway and many other individuals and organizations are working on solutions to reduce GHG emissions in the oil sands. What are your thoughts on transparency and emissions performance in the oil and gas sector globally?